Knowing how to make an angled cut will allow you to finish more advanced wood-working projects. Angle cuts add character to projects and they make them look better when used properly. Learning to make a 60 degree angle cut takes less than ten minutes, and you will only need a handful of tools that are available to any woodworker. 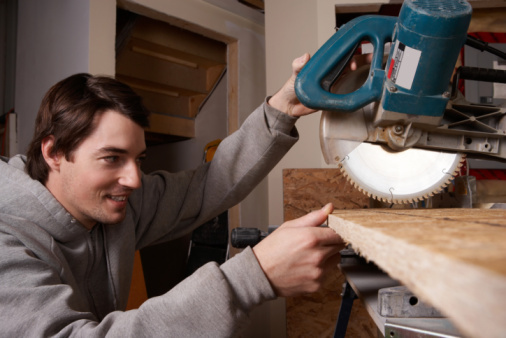 A miter saw offers the quickest way to make an accurate angle cut. Measure and mark the spot where you want the 60 degree angle to begin. Set your speed square on the lumber flatly and protruding edge of the square firmly against the edge of the wood. Slide your square up the wood until the pivot point reaches the mark you made on the edge. The pivot point of the square is the side of the lip that has an arrow pointing to it. Firmly hold the pivot point to the mark and slide the other end of the protruding edge of the square away from the wood until the edge of the wood is lined up with the 60 degree mark on the common scale located on your speed square. Draw a line along the short flat edge of the square that is sitting on top of the lumber. Remove the square and finish drawing the line the rest of the way across the lumber using a straight edge. Tile the circular saw or jigsaw so that it is close to the same angle as the line is and slowly begin cutting the line to create your 60 degree angle. Mark the location on your lumber that you want the angle to start from using a tape measure and a pencil. Release the angle adjustment handle on the front of your miter saw and turn the saw until the gauge is on 60 degrees. Push the lumber firmly against the fence of the saw and begin the cut at the line you marked. Cut through the lumber and set the scrap piece off to the side.